Telecommuting Accountant Jobs have held steady over the years as one of the career industries that lends itself well to working remotely with most of the work being done utilizing computers and software like Quickbooks, Quickbooks Online and Quicken. Increasing numbers of small businesses are using online accounting options for convenience and accountants must keep up with the various emerging softwares like FreshBooks, Wave Accounting and Soho Books. 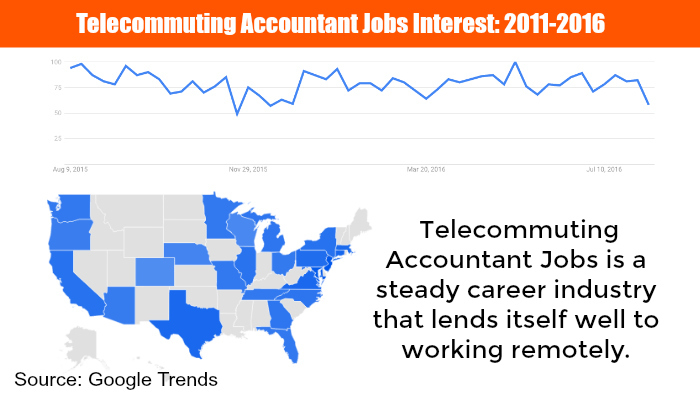 Google Trends shows steady interest in the field of telecommuting accountant jobs, and also includes the level of interest peaking within the states of New Jersey, Maryland, Virginia, Texas and Connecticut. With almost all accounting being done through either software installed on computers or through online accounting software, telecommuting accountants should be familiar with the basic mechanics of using some of the top used softwares. Quickbooks Online continues to be the most used online accounting software, however other companies have emerged over the past several years and are becoming more widely used. This software company provides free accounting software to small businesses with 9 or fewer employees. They are financially supported by partnering with larger companies that offer business services to Wave users, like American Express and Staples. The company also features a Pro Network that accountants can join and users are referred to if they need accounting assistance. For businesses that are heavy on customer invoicing, FreshBooks is the self-proclaimed #1 accounting software for invoicing, though it does provide all the basic functionality of other cloud-based accounting softwares. With their Accountant Center, they also make it easy for telecommuting accountants to access client information and transactions for ease of bookkeeping. This software company is an alternative to QuickBooks Online and has a full suite of features that will rival competing online accounting software options. Xero has a full area dedicated to education and training for accountants or bookkeepers who would like to learn how to use the software and use it for small business clients. The training courses also double as CPE hours, so finance experts can keep up to date as well on best practices. Prepares business (1120, 1120S, 1065) tax returns. Can require 3 to 5 Years experience preparing business tax returns. Requires EA License or CPA Certification and commonly a Masters degree in Accounting. Prepares individual (1040) and business (1120, 1120S, 1065) tax returns. Can require 3+ Years experience preparing individual and business tax returns. Requires EA License or CPA Certification. Work with project managers to stay within budget and prepare receivables/payables. Preparation of monthly billings and effectively communicate with project managers regarding contract documents and change orders related to billing. May or may not require CPA Certification. Prepares financial reports for monthly, quarterly, and annual budget process related to project. Develops continuous evaluations of short and long-term strategic financial objectives. Creates budgets, establishes schedules, collecting, analyzing and consolidating financial data; recommending plans. The Bureau of Labor Statistics outlook for Accountant jobs remains positive with an expected 11% increase by 2024. The BLS also states that 1 out of 5 accountants work more than 40 hours per week, especially during tax season. One of the largest accounting companies in the U.S. handling outsourced accounting needs for established businesses and funded startups. AccountingDepartment.com has been around since 2004 and received multiple awards for professional services. This is a remote company with telecommuting accountant and CFO jobs available. This company specializes in providing tax accounting services to traders. As a remote company, all their accountants have the option to telecommute. Using cloud-based software, they provided trader tax compliance accounting services. All CPA’s must have a bachelors or masters degree and 3-5 years of experience. As a virtual company, Bookminders provides outsourced bookkeeping services through experienced accountants. All telecommuting accountants must have a 4 year degree and a minimum of 5 years accounting experience in order to be considered for employment. This company hires only those in the Pittsburgh and Philadelphia areas as employees are required to make weekly onsite client visits. Financial Operations Associates (FAO) provide bookkeeping and business support while telecommuting from their home offices. 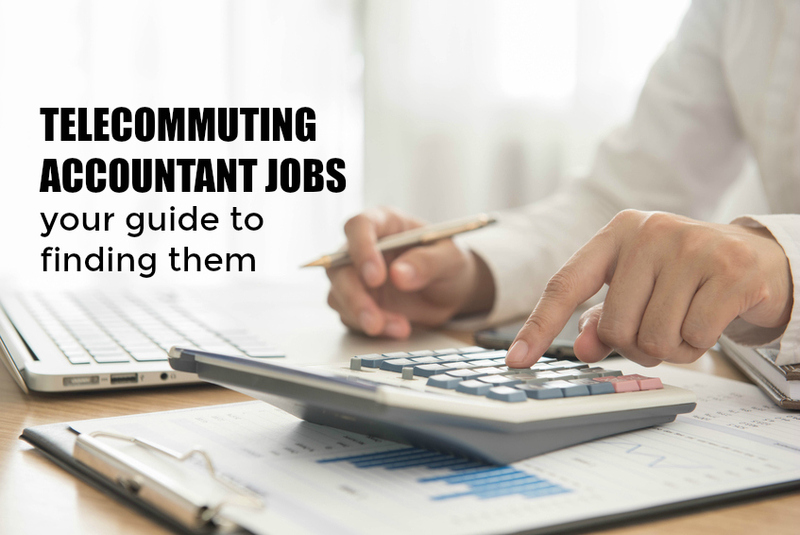 Required experience for these telecommuting accountant jobs is steep. Candidates must hold a degree in Accounting and have 10-15 years of experience in order to be considered for employment. 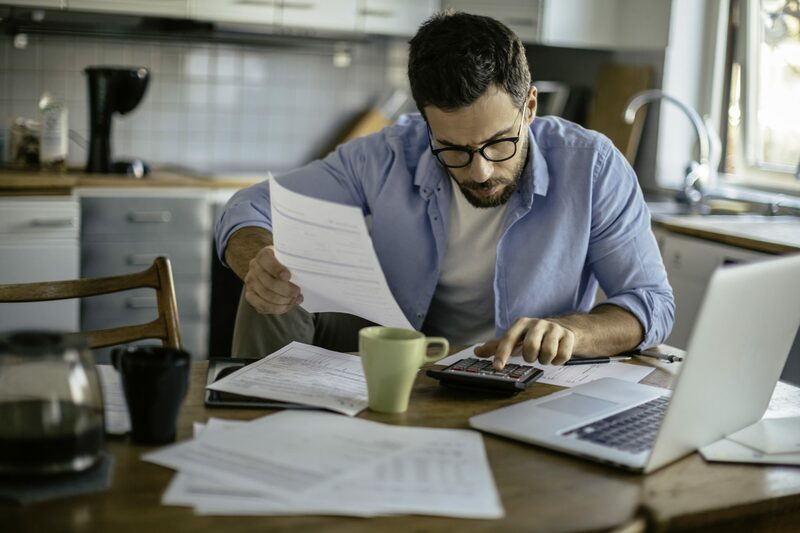 To work as a telecommuting accountant for Intuit, you must be a CPA or an Enrolled Agent with a minimum of 5 years experience with tax return preparation. Remote positions are available throughout the U.S. on an ongoing basis. Most telecommuting accountant positions stipulate they are seasonal, though they accept applications for them throughout the year. This accounting firm employs both telecommuting CPA’s and Accounting Team Members to work remotely providing services to clients. CPA’s are employed as Virtual Chief Financial Officers for companies who do not have the staff to hire their own CFO. Candidates must be naturally consultative and not sales oriented. Greenback Tax Services provides tax preparation services catered to individuals who are living abroad. Telecommuting Accountant jobs and IRS Enrolled Agent positions are available with the company and allow employees to work remotely. The company was formed in 2008 and has been featured in The Wall Street Journal, Reuters and Time. Telecommuting Accountant Jobs is one of the most searched for remote jobs in the accounting industry as of 2016. With the rise in job seeker interest for these positions, the number of companies that are offering telecommute accountant positions and the level of telecommuting that can be provided, from partial to 100% telecommute, TelecommuteJobs.com has ranked this category of telecommuting accounting jobs as a Level 5, or most highly sought after telecommute position.